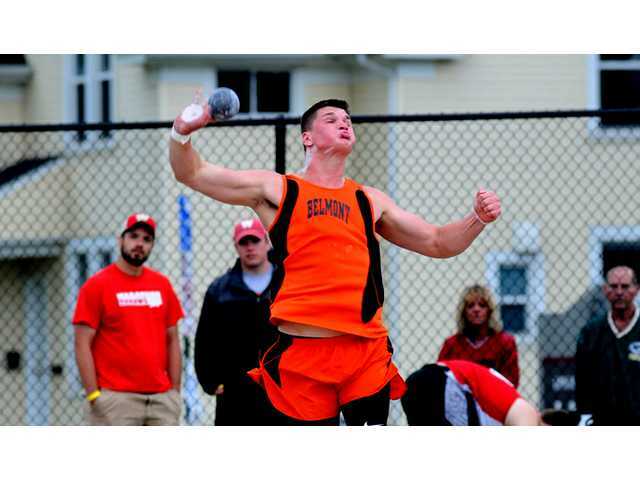 BELMONT SENIOR Jacob Wedig was crowned the Division 3 boys’ shot put champion with a winning toss of 56’7.75” at Saturday’s WIAA State Track and Field Meet. POSTED June 8, 2018 9:47 a.m.
LA CROSSE – Following an injury-plagued senior year, Belmont’s Jacob Wedig was hoping to finish off his prep athletic career with a bang at the 2018 WIAA State Track and Field Meet. And, quite a bang it turned out to be as the Braves’ senior went out as a state champion by winning the Division 3 boys’ shot put by more than a two-foot margin with his first-place heave of 56’7.75” at UW-La Crosse’s Veterans Memorial Stadium on Saturday, June 2. “It really couldn’t have turned out better for him. He’s such an inspiring young man who has gone through so much with his injuries and pain, and he’s always looked at the positive side of everything and uses every opportunity he can to get better,” said Belmont head coach Amber Eisele. After missing the entire football season and most of the basketball season while recovering from an injury he suffered late in the summer, Wedig showed that all the hard work he put in during rehabilitation paid off by earning a returning to top form in the throwing events and earning a return trip to the state meet in both the discus and shot put for the second year in a row. Wedig, who medaled in the discus with a sixth-place performance a season ago, finished 10th in the event this year with a top mark of 144’8” at state on Friday afternoon. “I know the discus didn’t turn out as well as we wanted it to, but he’s really been having a hard time with his discus (throws) the past couple years. I think it’s because his shot form is so good that it kind of throws off his discus,” noted Eisele. He returned to the stadium on Saturday to compete in the shot put and left as a champion, bettering his runner-up finish from a season ago by over three feet after taking first with a mark of 56’7.75”. Wedig becomes the 17th state champion in Belmont High School history and the 11th male from the school to win a state title. He also joins his older brother, Tucker, as the lone shot put champions at Belmont. Tucker won both the D3 shot and discus at the 2014 and 2015 WIAA State Meets. Wedig will continue athletic career on the collegiate gridiron at Iowa Central Community College, but he will always remember how he capped off his prep career by standing tall atop the awards’ podium as the champion on Saturday. “All year round he is practicing the shot put. He spent morning and nights in the weight room and the rehab facility. He dedicates all of his time to just being better all-around in athletics and academics, so winning this was the icing on the cake. It shows that everything he’s gone through was all worth it in the end. I’m just so proud of him and everything that he’s been able to accomplish. Our team is really going to miss him. He’s a great role model, an inspiration and a great team captain,” said Eisele.